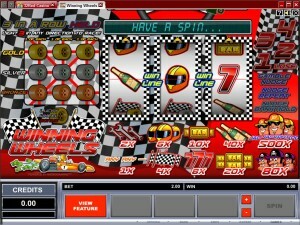 In Winning Wheels, you will find a game which was created by Microgaming. The theme is racing related, with the sport being Formula 1. It is a classic title if you go by the number of reels and paylines used in it, but the design is detailed enough to belong in a better category, while the features can compete with any modern slot machine. The 3 reels of Winning Wheels come with only 1 bet line on them. The bonus game can provide you a rich experience with the various stages and prizes it offers, plus you get a top payout of up to $5,000. 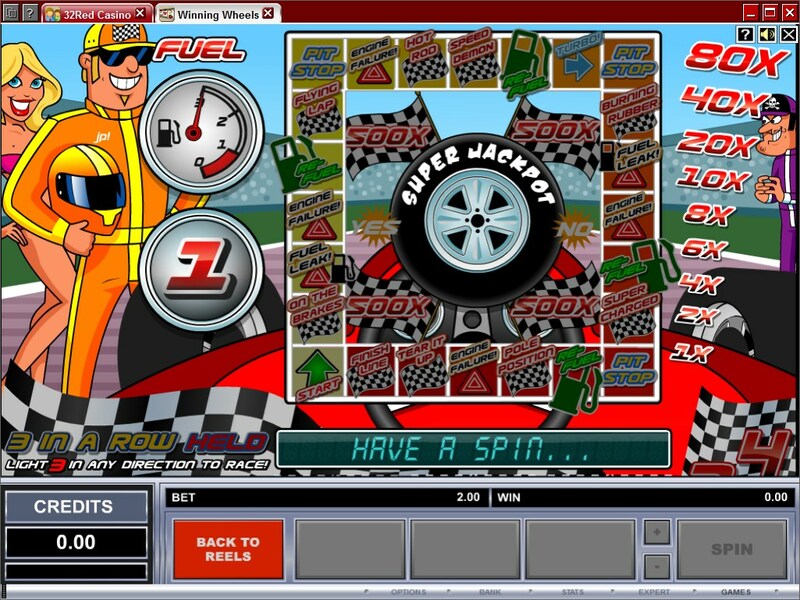 While you get a single feature while playing the base game in Winning Wheels, it takes you to a board game style screen where you have an incredible variety of prizes that you can win with a bit of luck. Access to this board game feature is obtained by getting three tire symbols, either arranged in diagonal, vertically or horizontally. Once you’re inside the bonus game, a new screen loads, showing you the racing track and the pilot that won the race. 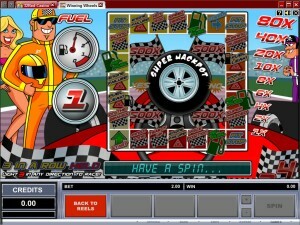 You get a board game which you can advance on, winning payouts and a Super Jackpot along the way. The names of the bonus features which this board game mentions are On the Brakes, Fuel Leak, Engine Failure, Re-Fuel, Flying Lap, Pit Stop, Hot Rod, Speed Demon, Turbo, Burning Rubber, Super Charged, Pole Position, Tear it up and Finish Line. It’s not a difficult way of placing a bet, as the game only requires one coin and you simply decide how much it should be worth. The minimum value of that coin is $0.10, while its highest value is at $10. The game will reward you with top payouts of 500x, which in the case of the maximum denomination means up to $5,000. The designers worked harder on this game than they do on most 3 reel slot machines, but they didn’t make it look like a modern slot. It still has that cartoon like feeling to it, like you were watching a 90’s animation series, but that still is a pretty good design for a game inspired by the classics. Symbols: Racer (500x), Evil Racer (80x), Champagne (40x), Two Gold Bars (20x), One Gold Bar (10x), Red 7 (8x), Helmet (6x), Checkered Flag (4x) and Wrench (2x). The racing theme is handled rather well for a classic slot machine, so I suggest you give it a go if you’re a fan of this motor sport. There aren’t too many 3 reel titles with this theme and a good design. 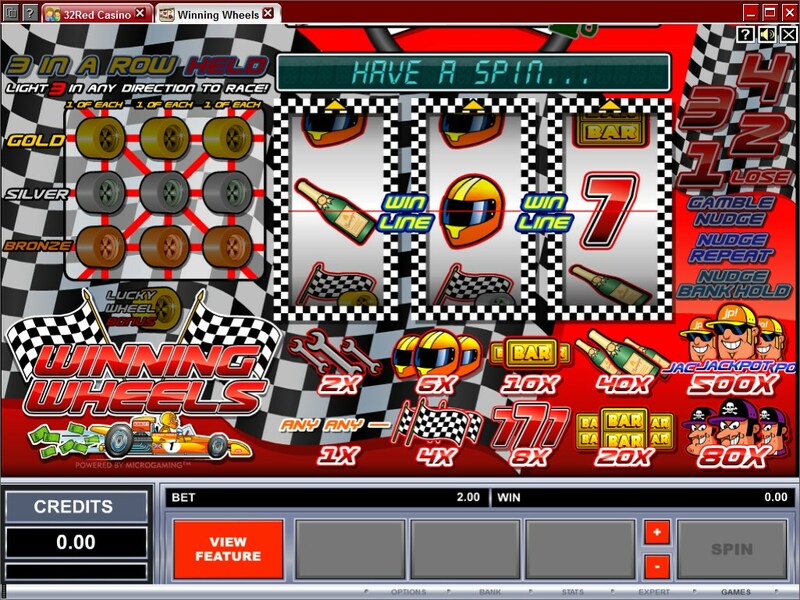 The Winning Wheels slot machine is offered through the Microgaming platform, so if you want to play it for real or just to practice, look out for casinos that use it.